Progressive Web Apps (PWAs) are simply web apps that are progressively enhanced with native app-like features on supporting platforms and browser engines, such as launch-from-homescreen installation, offline support, and push notifications. On Windows 10 with the Microsoft Edge (EdgeHTML) engine, PWAs enjoy the added advantage of running independently of the browser window as Universal Windows Platform apps. 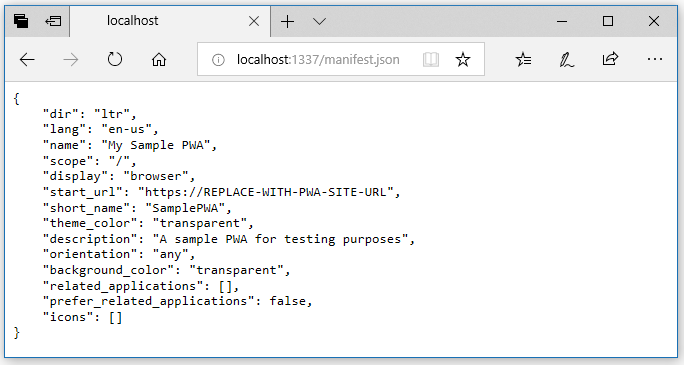 This guide will give you an overview of PWA basics by building a simple localhost web app as a PWA using Microsoft Visual Studio and some PWA Builder utilities. The "finished" product will work similarly across any browser that supports PWAs. 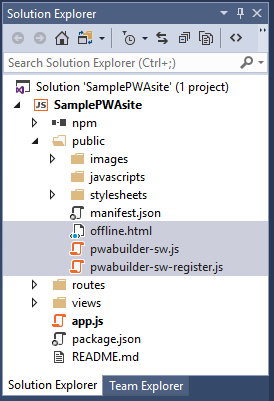 For a quick way to convert an existing site to a PWA and package it for Windows 10 and other app platforms, check out PWA Builder. You can build PWAs with any web development IDE. The following are only prerequisites for this guide, which will walk you through PWA tooling support in the Windows developer ecosystem. 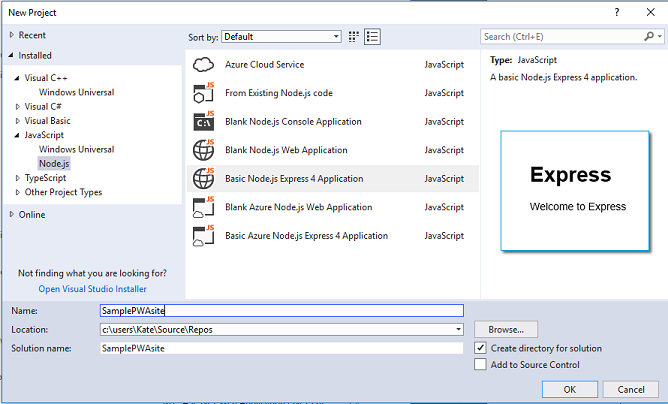 For the sake of simplicity, we'll use the Visual Studio Node.js and Express app template to create a basic, localhost web app that serves up an index.html page. Imagine this as a placeholder for the compelling, full-featured web app you'll be developing as a PWA. Launch Visual Studio, and start a new project (File > New > Project... or Ctrl+Shift+N). Once your new project loads, Build (Ctrl+Shift+B) and Start Debugging (F5). Verify that your index.html file is loading on http://localhost:1337. Now its time to wire up the basic PWA requirements for your web app: a Web App Manifest, HTTPS and Service Workers. A Web App Manifest is a JSON metadata file describing your app, including its name, author, entry page URL, and icon(s). Because it follows a standards-based schema, you need only supply a single web app manifest for your PWA to be installable on any platform / OS / device that supports PWAs. In the Windows ecosystem, your web app manifest signals to the Bing web indexer that your PWA is a candidate for automatic inclusion in the Microsoft Store, where it can reach nearly 700 million active monthly users as a Windows 10 app. If this were an existing live site, you could quickly generate a web app manifest using PWA Builder. Since its still an unpublished project, we'll copy in a sample manifest. In the Visual Studio Solution Explorer, right-click the public folder and select Add > New File..., specifying manifest.json as the item name. If this were a real PWA, you'd obviously want to customize at least the name, start_url, short_name, and description, as well as the icons (we'll get to those next...). See the Web App Manifest reference on MDN web docs to learn more about the different member values and their purpose. Next, let's fill in the empty icons array with actual image paths. For that, we'll use PWA Builder's App Image Generator. Using a web browser, download this sample 512x512 PWA image. Go to the PWA Builder App Image Generator, and select the pwa.png image you just saved as the Input Image and then click the Download button. Open and Extract the zip file. In the Visual Studio Solution Explorer, right-click the public folder and Open Folder in File Explorer. Create a New folder named images. Open (with Visual Studio or any editor) the icons.json file from the extracted zip and copy the "icons": [...] array into your project's manifest.json file. Now we just need to associate our web app manifest with the app itself. Open the layout.pug file (in views folder) for editing, and add this line right after the stylesheet link. (Its simply Node's pug template shorthand for <link rel='manifest' href='/manifest.json'>). ...in addition to being HTTPS, using service workers, complying with Microsoft Store Policies. Service Workers and other key PWA technologies that work with service workers (such as the Cache, Push, and Background Sync APIs) only work across secure connections, which means HTTPS for live sites or localhost for debugging purposes. If you were to publish this web app as a live site (for example, by setting up an Azure free account), you'll want to ensure your server is configured for HTTPS. If you're using the Microsoft Azure App Service to host your site, it will will be served over HTTPS by default. For this guide we'll continue using http://localhost as a placeholder for a live site served over https://. Service Workers is the key technology behind PWAs. They act as a proxy between your PWA and the network, enabling your website to act as an installed native app: serving up offline scenarios, responding to server push notifications, and running background tasks. Service workers also open up all kinds of new performance strategies; and website need not even be full-blown web app to take advantage of the service worker cache for fine-tuned page load performance. You associate a service worker with your app by registering it to your site's URL origin (or a specified path within it). Once registered, the service worker file is then downloaded, installed, and activated on the client machine. For more, MDN web docs has a comprehensive guide on Using Service Workers and a detailed Service Worker API reference. For this tutorial, we'll use a ready-made "Offline page" service worker script courtesy of PWA Builder. From this, you can go on to customize it with more elaborate functionality according to your needs for performance, network bandwidth, etc. Check out Mozilla's Service Worker Cookbook for a number of useful service worker caching "recipe" ideas. Open https://www.pwabuilder.com/serviceworker and select the (default) Offline page service worker and click the Download service worker button. ...to the public folder of your Visual Studio web app project. (From Visual Studio, use Ctrl+O to open file explorer to your project and navigate to the public folder). Its worth reviewing the code in both of these files, to get the gist of how to register a service worker that caches a designated page (offline.html) and serves it when a network fetch fails. Next, we need to create a simple "offline.html" page as a placeholder for our app's offline functionality. So that your site will load and run your service worker registration script. This instructs your app to serve the offline.html file (when your service worker fetches it for the offline cache). Open the Edge DevTools Console (Ctrl+Shift+J) and verify the Service worker was registered. Still in the Debugger, expand the Cache control and verify that the offline.html page has been cached. Time to try your PWA as an offline app! In Visual Studio, Stop Debugging (Shift+F5) your web app, then open Microsoft Edge (or reload) to your website's localhost address. It should now load the offline.html page (thanks to your service worker and offline cache)! Let's make our PWA even more "app-like" by adding client-side support for push notifications using the Push API to subscribe to a messaging service and the Notifications API to display a toast message upon receiving a message. As with Service Workers, these are standards-based APIs that work cross-browser, so you only have to write the code once for it to work everywhere PWAs are supported. On the server side, we'll use the Web-Push open-source library to handle the differences involved in delivering push messages to various browsers. The following is adapted from the Push Rich Demo in Mozilla's Service Worker Cookbook, which is worth checking out for a number of other useful Web Push and service worker recipes. Install the NPM web-push library. Generate VAPID keys for your server. The output should result in a JSON object containing a public and private key, which we'll copy into our server logic. ...and then copy in the publicKey and privateKey values that you just generated. Feel free to customize the mailto address as well (though its not required to run this sample). The Mozilla Services engineering blog has a nice explainer on VAPID and WebPush if you're interested in the details of how it works behind the scenes. Now its time to set up routes for handling push-related requests from the PWA client, including serving up the VAPID public key and registering the client to receive pushes. In a real scenario, a push notification would likely originate from an event in your server logic. To simplify things here, we'll add a "Push Notification" button to our PWA homepage for generating pushes from our server, and a /sendNotification server route for handling those requests. Still in your index.js file, append the following routes just after the VAPID initialization code you added in Step 2 above. // A real world application would store the subscription info. With the server-side code in place, let's plumb in push notifications on the PWA client. As part of their role as PWA network proxies, service workers handle push events and toast notification interactions. However, as it is with first setting up (or registering) a service worker, subscribing the PWA to server push notifications happens on the PWA's main UI thread and requires network connectivity. Subscribing to push notifications requires an active service worker registration, so you'll first want to check that your service worker is installed and active before trying to subscribe it to push notifications. 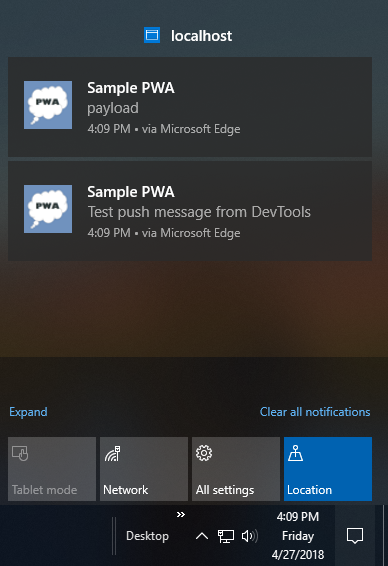 Before a new push subscription is created, Microsoft Edge will check whether the user granted the PWA permission to receive notifications. If not, the user will be prompted by the browser for permission. If the permission is denied, the call to registration.pushManager.subscribe will throw a DOMException, so you'll want to handle that. For more on permission management, see Push Notifications in Microsoft Edge. Check out the MDN documentation on PushManager and NPM docs on Web-Push for more details on how these APIs work and their various options. Set up push and notificationclick event handlers. With our push subscription set up, the remainder of the work happens in the service worker. First we need to set up a handler for server-sent push events, and respond with a toast notification (if permission was granted) displaying the push data payload. Next we'll add a click handler for the toast to dismiss the notification and sort through a list of currently open windows to open and/or focus the intended PWA client page. Time to test push notifications in your PWA! a. Run (F5) your PWA in the browser. Because we modified the service worker code (pwabuilder-sw.js), we'll need to open the DevTools Debugger (F12) to the Service Worker Overview panel and and Unregister the service worker and reload (F5) the page to re-register it (or you can simply click Update). In a production scenario, the browser will check regularly check for service worker updates and install them in the background. We're just forcing it here for immediate results. Click Yes to enable toast notifications for your PWA. ...and with that you have the basics of PWA push notifications. In a real app, the next steps would be to implement a way to manage and store push subscriptions and to properly encrypt payload data being sent across the wire. This guide demonstrated the basic anatomy of a Progressive Web App and Microsoft PWA development tools including Visual Studio, PWA Builder, and Edge DevTools. Of course, there's a lot more that goes into making a great PWA beyond what we covered, including responsive design, deep-linking, cross-browser testing and other best practices (not to mention actual app functionality! ), but hopefully this guide gave you a solid introduction of PWA basics and some ideas on getting started. 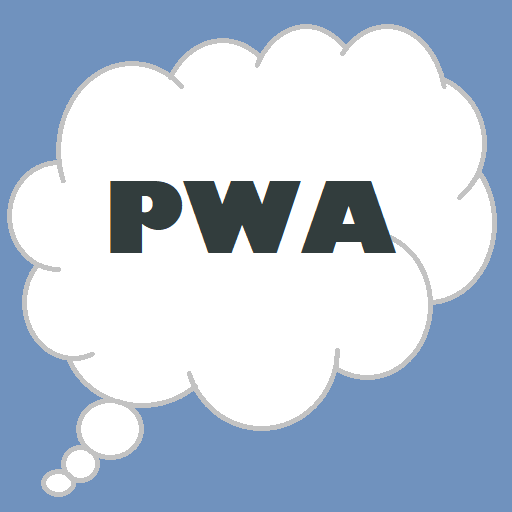 If you have further questions on PWA development with Windows and/or Visual Studio, please leave a comment! Windows tailoring. Using simple feature detection, you can progressively enhance your PWA for Windows 10 customers through native Windows Runtime (WinRT) APIs, such as those for customizing Windows Start menu tile notifications and taskbar jumplists, and (upon permission) working with user resources, such as photos, music and calendar. PWAs in the Microsoft Store. Learn more about the benefits of app store distribution and how to submit your PWA. Also be sure to explore the great resources from around the dev community! MDN web docs and Google Developers have excellent guides on Progressive Web Apps. https://pwa.rocks/ showcases real-world examples of PWAs, and https://hnpwa.com/ compares different frameworks and performance patterns for implementing a sample (Hacker News reader) PWA.